Penn’s Corner Farm Alliance lamb shares are 100% grass-fed spring lambs from Pucker Brush Farm in Shelocta, PA. Pasture raised and free range, these lambs are known for their exceptional taste! They are hormone-free and antibiotic-free. They will be about 35 - 55 lbs hanging weight per lamb. Interested in our Lamb Share? 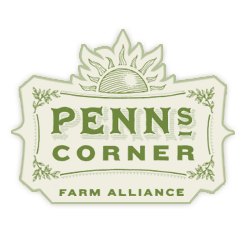 Email farmstand@pennscorner.com to place your name on our waiting list! Baby lambs are starting to be born now and will feed on grass all spring and summer. We start taking deposits in May/June, expecting that your lambs will be ready around August (or as nature dictates, late summer/early fall). A $100 deposit (check or credit card) will be required to reserve your order and the rest can be paid upon pickup. Neck - choose a sliced neck with the bone-in, or the neck will be ground and the bones are cut in 2” pieces and send as soup bones. Liver - Available upon request. You can choose to have it whole or sliced. Other Organs - Available upon request. Additional Bones - Available upon request. If you choose your roasts to be bone-in there won’t be many additional bones. All cuts will be vacuum-sealed or wrapped in paper and frozen after butchering. All organs will be vacuum-sealed. The price will be about $8.87/lb for the hanging weight of the lamb. The total cost can vary depending on the type of cuts you request. Most of the lambs have a hanging weight between 35 and 55 pounds, so you could expect to pay around $436 total (the average price for a 45# lamb). Please note that the hanging weight is not the final weight after cutting. You can expect to receive about 75% of the hanging weight. If you have a preference for the size of your lamb share, please let us know. A $100 deposit will be required upon placing your order, and the rest can be paid in full upon pickup. We take check or credit card. Pickup is at our warehouse in Lawrenceville, 150 54th Street Pittsburgh, PA 15201. We will contact you when your share is ready to pickup. The lambs at Pucker Brush Farm in early Spring.